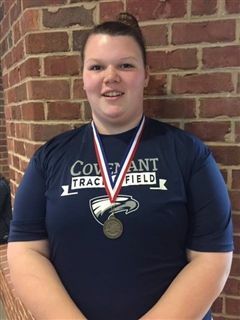 Hallie Reese became the VISAA Indoor Track State Champion in Shot Put with a throw of 35'4'' and beat the competition by nearly 2 feet! She has been an indoor and outdoor track athlete for the past 5 years, competing in the shot put and discus events. To prepare for her event, and especially for states, she said she practices her footwork, lifts a lot, and works on her mental game. "My game plan for states was to come out and throw a PR (personal record) for the first throw to "put it away", she said. That's exactly what she did to have the best throw against 20 other girls this weekend. She says she may walk on for shot put on a college track team when she heads to college next year, but plans are still in the making. Congratulations Hallie!